2001 Graduated from the University of Western Ontario with a Bachelor of Science, Honours Human Ecology. 2004 Graduated from The Ontario Institute for Studies in Education of The University of Toronto (OISE) with a Bachelor of Education. 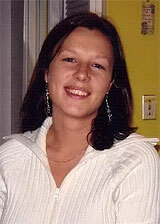 On September 8, 1978 Amanda was born in Brampton, Ontario. On her first birthday she moved to London, Ontario. She grew up there with her parents, Pam and Frank, and her older brother, Matthew and her younger sister, Kathryn. As a young girl Amanda enjoyed playing sports such as baseball and basketball, exhibiting some “tomboy” tendencies. She was not fond of wearing dresses and on the occasion of her First Communion she announced that she would not wear a dress again until her wedding day. Amanda’s determination and certainty about how she would live her life were already evident. Amanda always had a way that drew people to her – she made everyone feel that they were important. She had a great capacity to love and be loved. With her amazing blue eyes and her natural smile, she brightened up any room she walked into. People felt better just being around Amanda. She was always quick to forgive and forget. Her warmth and sincerity were genuine and she acted on these feelings. She wanted to help those less fortunate and for a time considered adopting a child in Africa. After thinking about it, she decided there were many people around her that could use the money. People in her life would find a few dollars tucked into their knapsacks when she knew they were a little short. Amanda had unique little quirks. Her hair was straight but she was always straightening it; she would suggest trying a new drink called a ‘Mojito’ because it ‘sounded good’ and then say, “Let’s keep drinking it ’cause it smells like Grandma’s house”. Some of her friends found her taste in music and TV questionable- Boy Bands and reality TV shows – ‘Survivor’ was one of her favourites. Amanda’s love for outdoor activities remained with her. She tried all the things that she could fit into her busy life including white water rafting and mountain climbing and dreamt of combining her love of travel and sport with a trip to Africa to conquer Mount Kilamanjaro. Perhaps Amanda knew that she needed to live each day as if it was her only day. On November 17, 2006, Amanda was told that she had untreatable cancer and as with everything in her life, Amanda took the time she needed to adjust to the enormity of this pronouncement and then made the most of her days. She longed to live until spring – and she did! Spending her time in her family home she lived – she did not wait to die – with the love and support of all the people that were so special to her. Amanda remained in control of her day to day life and took every moment one at a time. She did not dwell on what she could not do, but did everything that she could do. She was courageous in her ability to adapt to the new challenges that were presented everyday. The Amanda Marie Cowan Memorial Scholarship Fund will provide an academic award for a deserving student at The Ontario Institute for Studies in Education at the University of Toronto. The Award, to be made each year on Amanda’s birthday, will recognize both the student’s academic promise and financial need.